Arack, Elephants and a questionable rub down. Hi loved ones, from the lost ones. Thought we would update you on our first week of our travels. It’s incredibly difficult for us to condense the last eight days into one blog post and don’t want to bore you so will try to keep this succinct, and summarise the events of each place we have visited so far. 2 – With the help of some friends, locating a ‘closed’ liquor store one evening, sliding between some metal shutters and entering what can only be described as a cave full of old drunk locals. Then being handed a bottle of ‘Arack’ and proceeding to drink under the stars with some Canadian chaps next to the temple of the tooth (no respect, terrible us). 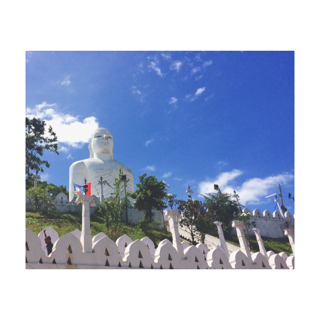 We did do a little tour which was nice but the best part was learning to drive a tuktuk through the hills. We were genuinely spoilt wih our time here. The guesthouse we stayed at made us feel like family and we had the most amazing few days. 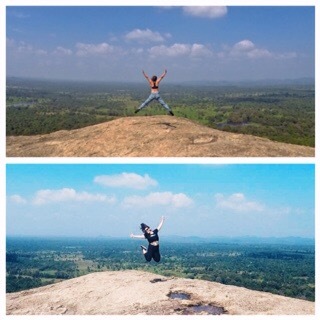 The owner took us to ‘Polonnaruwa’ which is an ancient Sri Lankan city; to ‘Pidurangala’ which is essentially the poor mans version of ‘Sigiriya’ and is pretty much just a massive rock with insane views at the top, where we did some rock climbing. 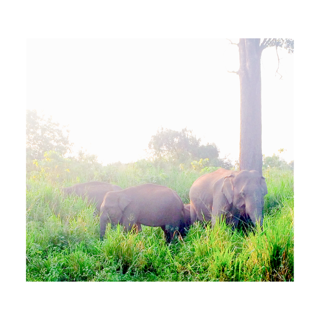 But the most amazing part of our stay here was being taken to see elephants in the wild. An experience that neither of us will ever forget. N.b we thought we should probably mention the weirdest experience either have us ever had, let us briefly explain. Over here they have tourist traps …or what they call ‘herb and spice gardens’. Ah, the beauty of a herb and spice garden (not our first) where some locals talk you through a wild spice rack and no one really takes much interest. However, after our ‘tour’ we were taken into a dark, sweaty and danky room, and recieved an unwanted but compulsory massage with what can only be described as Vicks. Tears of laughter were streaming as we received a proper rub down. Jazz was not wearing a bra, which was pretty risqué for the company we were in, and my guy proceeded to go down the back of my leggings. Worst part: we had to pay for the fresh hell we endured. We are currently in Mirrisssa loving life on the beach, but the journey here must be what hell is like. 12 hours on trains, 24 hours with no food, 1 bottle of water, 1 very ill and smelly man, 1 crying Jess, 2 girls wih zero morale and 1 Bob Marley dealing tuktuk driver, let’s leave it at that and forget about it. Life can be so magical line dancing amongst stars! Jessica I love you for who you are. Hi Jazz and Jess, I have just managed to locate your blog – no thanks to Wayne!! (Thanks Jazz). It sounds as if you are having a wonderful time.